Leather hangings were a popular way to decorate walls in Europe in the 18th-century. They were often called Spanish leathers because they originated in Spain in the 17th century, but these early hangings were simply painted. 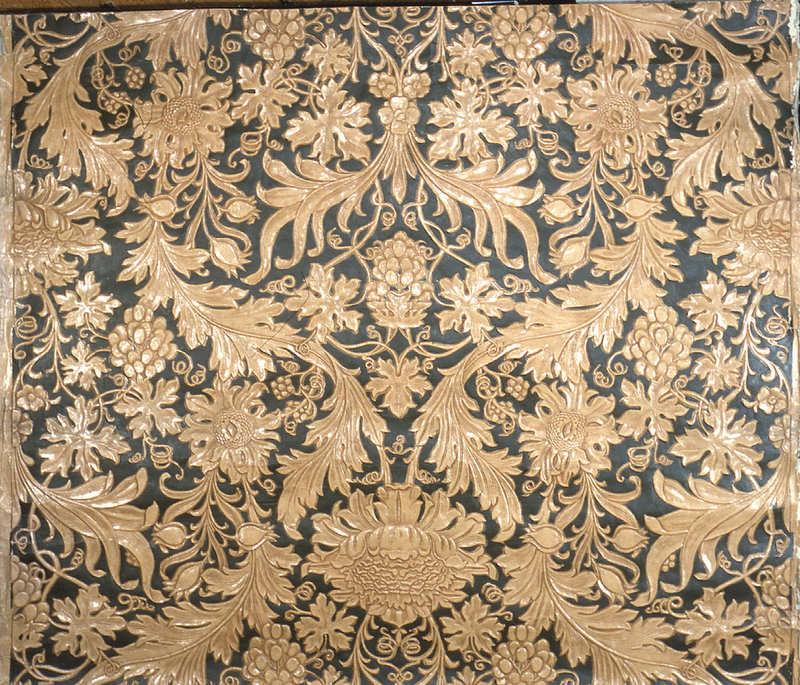 As the popularity of leather hangings increased in the Netherlands and England, it became more popular to emboss the leather and cover it with silver gilt and yellow varnish to imitate gold. Late in the 18th century, Japanese leather hangings were also imitated, as part of the taste for East Asian-inspired design. In the late-nineteenth century, imitation leather hangings, produced through a wide variety of means and materials, were incredibly popular in Britain. The popularity of these papers was due both to the three-dimensional effect of the paper and because of the general revival of 18th-century taste at the time. In Britain itself, molded papers such as Lincrusta and Anaglypta and embossed papers were produced via mass manufacture to satisfy demand. However, beginning in the 1870s, the English manufacture Rottmann, Strome, and Co. began to import, with resounding success, imitation leather papers from Japan. These papers were embossed and lacquered, with tinfoil used to create the effect of gilding. In the 1880s, the firm opened a factory in Yokohama for the sole purpose of producing these papers for export. By the end of the century, imported Japanese papers dominated the European market for imitation leather hangings. Despite their origin, most of these papers had names meant to evoke Spain, referring to the origins of European leather hangings. They also largely used European, especially Baroque and Rococo Revival, motifs, as in this paper, which copies William Morris’ Sunflower pattern introduced in 1879. In the end, papers such as these represent a unique way trade with Asia was used to satisfy European tastes.